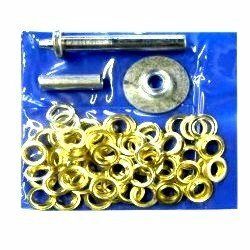 103 pc TARP TENT AWNING Repair GROMMET Install KIT TOOL Rust Proof Brass plated GROMMETS and INSTALLATION TOOLS Repair old tarps or customize tarps for your own uses! This set makes installing 1/2" grommets fast and easy. Once installed they stand up to high strength tests just like the originals. Includes 50 grommets, 50 washers, and installation tools. Features: Includes 3 tools, 50 grommets and 50 washers Hole diameter: approximately 1/2" (15/32") Total diameter: 15/16"
If you have any questions about this product by Blue monkey shop, contact us by completing and submitting the form below. If you are looking for a specif part number, please include it with your message.